MobArt Gallery presents CHINESE SEAL CARVINGIn Chinese tradition, there is a type of seal called “animal form seal”. 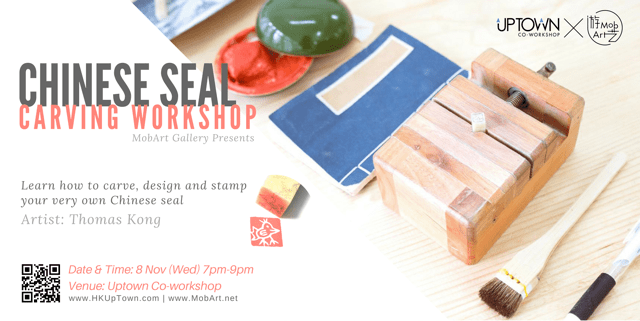 This workshop aims at animal form seal in negative engraving. ABOUT THE INSTRUCTORThomas graduated from Hong Kong Baptist University Visual Arts (Honours). His research area is Chinese craftsmanship by practicing Chinese seal (篆刻) with modern typography. He is currently studying postgraduate of Cultural Management in The Chinese University of Hong Kong. From choosing the stone, the font, the typography and the carving style, Thomas has made over 100 custom name seals so far. His artworks often references old ways of living and traditional Chinese culture but at the same time he tries to redefine the traditional craftsmanship by adding new elements. Thomas loves to share the rich history of Chinese seal carving and Chinese calligraphy which makes the workshops informative and fascinating!